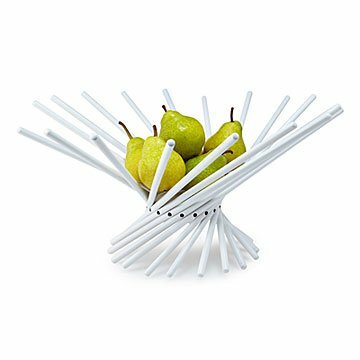 This geometric design gracefully unfolds into a striking basin for fruit and more. This simple, elegant bowl gives you a practical serving dish and a masterful centerpiece all in one. Architect Carlo Contin's geometric design gracefully unfolds black wooden lacquered spokes into a striking basin for fruit and more, then slides into an upright position for easy and compact storage. Black or white. Made in Indonesia. Can be used as a serving dish or centerpiece. Very modern! Flip it over and use the small end for a serving platter! It sits on a high counter, waiting for whatever fruit comes its way. It looks stylish whether full or empty, but it groans if too many heavy fruits are piled into it. I bought two when they became available after Xmas. I gave one to my mother for her birthday. It had such clean lines and beauty--that I gifted the second one to myself!!! Purchased the bowl as a gift for our son daughter-in-law's new house. It fits their modern decor and is functional. Looks great on their over-sized black granite kitchen island..especially with small orange pumpkins this fall season. I will definitely be doing business with you again! They are using it as a fruit bowl. It is not only functional, but also beautiful! My DIL loves this bowl! This is a great looking and functional bow.\l. Larger than I thought it would be, but it is a very nice piece for holding anything from fruit to decorative items. It spreads open easily and the finish is a very nice. I bought this as a gift, but I plan to buy one for myself. It is beautiful and my mother-in-law loves it.